Hamster vs Guinea Pig - Which Pet Is The Right Choice For Me? Home Guinea Pigs Hamster vs Guinea Pig – Which Pet Is Best? Love hamsters and guinea pigs? Can’t choose between the two cutest pets in the world? Then check out this guide – Hamster vs Guinea Pig – which is right for me? It’s one thing to decide you’re ready for a small pet in your life. But with so many to choose from, picking the right small animal can feel like a minefield. In this article we pitch two of the cutest and cuddliest contenders against each other. So that you can choose between a hamster and guinea pig with confidence. Obviously, when it comes to choosing the right small pet there’s no one animal that is universally more suitable for everyone. Worrying about making the right choice is often a big part of bringing home a new pet. Especially if it’s your first pet. This is a great sign that you’re taking pet ownership seriously, and you’re committed to giving your new friend the best life possible! Guinea pigs and hamsters both have loads to offer, and either can be a rewarding addition to your family. We’re going to compare all the different aspects of owning either, to help you choose between them. Hamster vs Guinea Pig – The Great Debate! It turns out the absolute worst way of choosing between a hamster and guinea pig is by conducting a poll of other pet owners. In 2012, American Veterinary Medical Association figures showed that 877,000 US households owned a pet hamster, and 847,000 households kept guinea pigs. And guinea pigs have been rapidly gaining on hamsters since the last survey in 2007. So as a nation, Americans are split right down the middle between guinea pigs fans and hamster lovers – there’s almost nothing in it! Let’s find out why both camps love their pets so much. It’s been nearly a century since we started keeping hamsters as pets. Compact, cute, and usually easy to tame, it’s not hard to see why they became a popular pet in this time, especially with children. We’re probably most familiar with the cuddly Syrian hamster, but with several dwarf varieties also widely available at pet stores, choosing the right hamster and giving it the right care is an article in it’s own right. Luckily we have just such an article right here! Guinea pigs have been kept as pets for as long as hamsters, but until recently they were a much less common choice among pet owners. Now they’re coming into the limelight and it’s no surprise. Still round, still fluffy, and still easy to handle, but a bit more substantial than a hamster. There’s only one species of domesticated guinea pig, but a kaleidoscope of colors and coat types to choose from. For an in depth look at guinea pigs alone, check out our complete guide to guinea pigs as pets. What is the difference between hamster and guinea pig? Most of us can picture the physical difference between guinea pig and hamster. Syrian hamsters are a palm-sized 5-7oz (140-200g), and dwarf breeds are even smaller, only reaching 1-2.5oz (30-70g). Guinea pigs meanwhile typically weigh between 1.5 and 2.5 lbs (700 to 1,100g). So they’re built on a different scale, but their physical characteristics are quite similar. Both are irresistibly chubby-looking, with big round eyes and petal ears. Neither have tails to speak of. You can find long-haired and short-haired hamsters and guinea pigs, not to mention curly haired and silky varieties. And with a very achievable amount of patience and commitment, both hamsters and guinea pigs will become used to being handled, and enjoy being stroked, and greet you to take snacks from your hand. So what’s different between them? In practical terms the biggest difference between hamsters and guinea pigs is how much space they take up in your home. Hamsters usually prefer to live alone. We believe solitary hamsters need at least a 30 gallon tank, but this will easily sit on a small side table or in the corner of a desk. Hamsters are enthusiastic diggers, but a tank will easily keep their sawdust trapped so you don’t find evidence of their excavations all over the floor. Meanwhile guinea pigs are not only bigger, but they need to be kept in pairs or herds. Two guinea pigs need around eleven square feet of space. For most people this means having a yard, and space for an outside hutch. Indoor cages are available, but you’ll need plenty of floor space and a laid back attitude to the “scatter zone” of sawdust which ends up outside the cage. 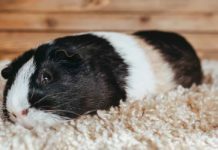 And because they’re bigger, guinea pigs can’t get all the exercise they need inside a hutch, so you’ll also need additional indoor or outdoor space where they can run around for several hours a day. Another important part of choosing a pet is making sure you can afford it – up front, and over the course of its life time. So let’s crunch numbers next. Hamsters themselves don’t cost much – $5-$20, depending where you are and whether you get them from a breeder or a pet store. If you’re starting from scratch, Investopedia puts the initial cost of getting a hamster at around $160, and the annual cost of looking after them at $100-150 a year. 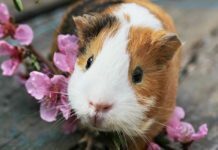 Unfortunately they didn’t include guinea pigs in the same article, but I have two pigs of my own, so I can share my own experience to give you a guideline. 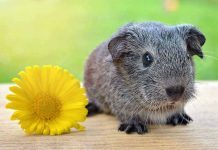 Guinea pigs cost $10-$40, depending whether you get them from a pet store or a breeder, and if they are remarkable example of their pedigree, mine cost $30 each from a nationwide pet store. I’ve just gone through my bank statements from the week we brought our guinea pigs home, and we spent just shy of $200 setting up for their arrival. Now I spend about $400 a year on sawdust, hay, food, toys and veterinary costs for both of them. Basically because guinea pigs are bigger and come in pairs (at least), you’ll have to pay for more of everything. And because they live longer, they’re also likely to cost more in vets’ bills over their lifetime. Whether you’re kitting out for a hamster or a pair of guinea pigs, it’s always worth having a look in Goodwill stores and on Craigslist for a bargain on good-quality second hand cages, hutches and outdoor runs. I’ve just touched on the difference in lifespan between hamsters and guinea pigs, so let’s talk about that properly next. Hamsters typically live two to three years. Dwarf species tend to live a little shorter, on average. Guinea pigs meanwhile typically live around five or six years, although many survive longer. In terms of enjoying maximum time with your pet, this looks like a clear win for the guinea pig, but sometimes short can be sweet too. We don’t always know what we’re going to be doing in five years’ time, or if we’ll live in the same house with the same amount of space. In these situations it’s good to make a pragmatic choice. Hamster vs Guinea Pig: How Interactive? A lot of us want a pet so that we can hold it and play with it. So if you’re looking for a pet which gives something back, would you be better off with a hamster or a guinea pig? Both guinea pigs and hamsters will relax into being held and stroked if they are handled regularly. Because hamsters are solitary by nature, they do tend to have a shorter patience threshold before they demand to be put down again. If you’re looking for small talk, a 1976 study in the UK found that guinea pigs make 11 distinct call types, which we can hear and use to understand what they’re thinking and feeling. Once you’re familiar with each other, guinea pigs often have plenty to say to their humans. 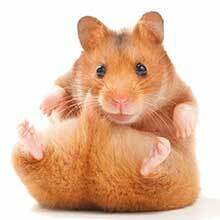 Hamsters meanwhile have a lot to say to each other, but their vocal range is largely outside our range of hearing, so we don’t get the pleasure of hearing what’s on their minds. But chit chat isn’t the only way of interacting with your pet. Grooming is another great way to share time with your pet. Long-haired varieties of hamster and guinea pig are certainly a bigger daily commitment, but that time together is perfect for developing a bond. And finally both hamsters and guinea pigs both love exploring, which gives us humans a chance to have fun by adding adventure into their lives. Constructing new hideaways for treats or connecting cardboard boxes and tubes to build new tunnels is a great way for kids (and adults!) to interact with both hamsters and guinea pigs. Hamster or guinea pig for kids? Hamsters have been a popular childhood pet for generations. They’re a fairly modest commitment in terms of time, money and space, and they always live inside the home, so children can look at them whenever they like. However they’re nocturnal, which can be disappointing for young children if their waking schedules don’t overlap. Guinea pigs are a bigger commitment, but they are most active in the mornings and evenings, when children are likely to be home. Guinea pigs are also less likely to bite than hamsters, preferring to wriggle away from a situation they don’t like. Critically, helping look after pets is a fantastic experience for children, but responsibility for animal welfare always ultimately lies with a grown up. The best pet for your children is one that YOU want and YOU are happy looking after. Hamster or guinea pig for teenagers? What about choosing a hamster or guinea pig for teenagers? As our kids get older, we reasonably begin to expect that if they want a pet, they will look after it. This could give hamsters an edge over guinea pigs, because they are a gentler commitment. That said, anyone will lose motivation to care for a pet if it wasn’t the pet they wanted. There’s no point giving a hamster to a teenager who wanted a guinea pig, and there’s no point giving a guinea pig to a teenager who wanted a puppy, unless you want to end up caring for them yourself. Can hamsters and guinea pigs live together? 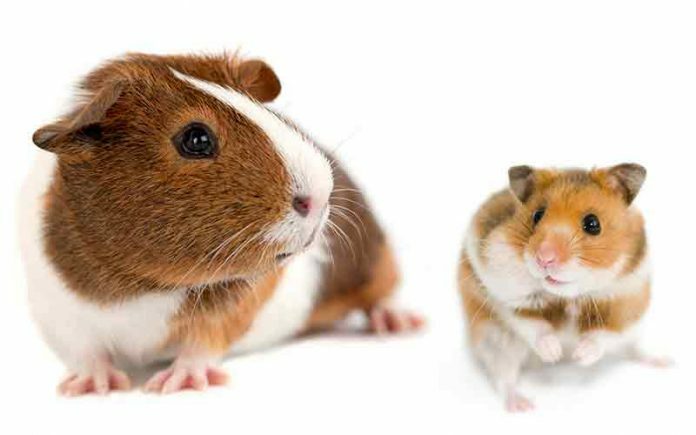 Guinea pigs and hamster are both popular pets, so you might already have one and be thinking of getting the other. Or you might already have both and wonder about keeping a hamster and guinea pig together. Not only are their dietary requirements and space needs very different, but hamsters are fiercely territorial. They’re also conditioned to fear anything big enough to eat them in the wild. This means putting hamsters and guinea pigs together would be enormously stressful for the hamster. Hamsters are quick to bite when they feel threatened by a larger animal, and guinea pigs will bite back in self defense. Owing to their difference in size, this is likely to cause a great deal of harm to the hamster, if not kill it. In all probability, the guinea pig will end up injured too. Can hamsters and guinea pigs play together? Again, this is unlikely to end happily. If there is more than one human at home, you could try sitting next to one another holding a guinea pig and a hamster, but really anything more than looking at each other from a distance is likely to be incredibly stressful for your hamster. Watch out for signs of either animal becoming agitated and break contact immediately. Hamster vs Guinea Pig – Which Should I Get? One thing is for sure: choosing between guinea pigs and a hamsters is a nice problem to have. They’re both cute to look at and easy to handle, and their natural curiosity means they show as much interest in us as we do in them. They’re easy for children to handle when supervised by an adult, and there are lots of fun ways for kids to get involved in making games for their new friend. Choosing the right pet for you will always depend on your personal circumstances. Even small pets are big commitments if you’re not motivated to look after them, so only ever choose a pet you really want to care for, and you’ll be rewarded with a charming new friend. Are you Team Hamster or Team Guinea Pig? Have you already made your choice between hamster and guinea pig? Can you think of some comparisons that I’ve missed? Tell us which pet you choose and how you knew they were right for you in the comments section below. Next articleCan Hamsters Eat Celery? Team Guinea pig! They’re the best!